James Wide, who worked for the Cape Government Railways in South Africa in the mid-1800s, developed a reputation for fearlessness. He had a habit of jumping from one railway car to the next while he was on the job, even if the train was moving. This recklessness earned him the nickname of “Jumper”, but it nearly cost him his life in 1877 when he fell beneath a moving train while jumping between cars. Jumper survived the fall, but he was badly injured. The train severed both of his legs at the knee. Fearful of losing his job (there was no workers’ compensation in those days), Jumper made himself a pair of wooden peg legs and took a post at Uitenhage station. He also made himself a wooden trolley to help himself get around faster, but he was still unable to perform some of his duties due to his disability. Jumper had to figure out a way to get his job done, but how? Inspiration struck when he visited a local market and saw a chacma baboon named Jack leading an ox cart and managing the oxen quite deftly. Jumper was impressed with the baboon’s abilities and persuaded his owner to sell Jack to him to help him at work. Jack lived with Jumper in his house, and first started helping Jumper out by pushing him around on his trolley. Jumper soon realized, though, that Jack was capable of doing more. He taught him to deliver keys to the conductor of a train when he heard a special signal. Jack got so good at this that he could eventually perform the task without any prompts. Jack even learned how to work the railway’s signals, under supervision from Jumper of course. Jack also became very good at this job, too. Jack became something of a celebrity, and people came from all around the Cape Town area to see the baboon signalman. But the idea of a monkey running the trains upset one concerned citizen, who wrote a formal letter of complaint to the authorities. A manager was sent to Uitenhage station immediately, and Jumper (along with Jack) was fired. Jumper begged the manager to reconsider his decision, and convinced to test Jack’s competency to operate the signals. Possibly to amuse himself, the manager agreed. He must have been surprised when Jack passed all his test with flying colors. The baboon even checked to make sure his work was correct before proceeding. Jumper got his job back, and Jack was officially hired by the railroad. 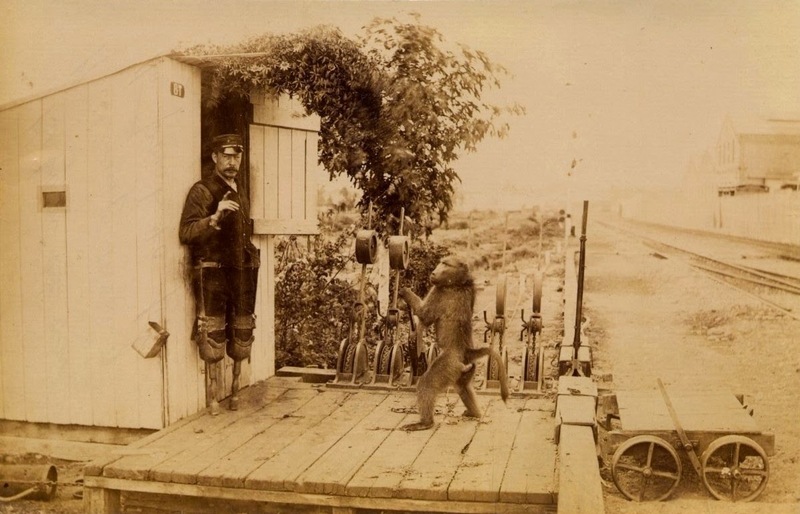 He was the first and only known baboon in history to work for a railroad. He was paid 20 cents a day and half a bottle of beer every week. He continued in this capacity for nine more years, never making a mistake. Jack eventually died from tuberculosis in 1890. His skull is on display at the Albany Museum in Grahamstown, South Africa.